Adventure Island wanted to reach out to the right audience and spread word about its famous rides, attractions, ambiance and the fun-factor. To accomplish their objectives, they launched effective campaigns or contests on various social media sites to bring about engagement and interaction with the people. They were successful in driving almost 28K check-ins in just 8 months. 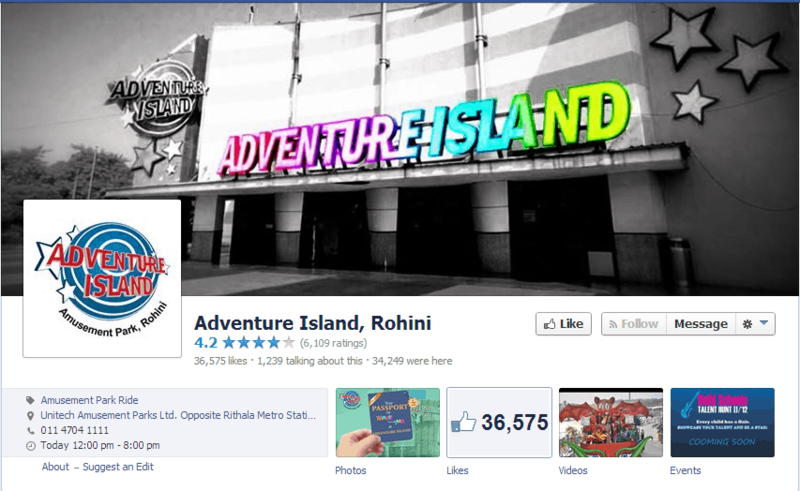 When they started working on Adventure Island’s Facebook page, they only had 7,000 likes but within eight months the number of likes increased to 35,000 that is somewhere around five times more than what it was. The most remarkable point is that it all happened without employing any paid ad campaign and was purely natural. Recently, Adventure Island was felicitated with some prestigious awards like winner for the Best Social Media Activity and winner for the best human resource management as well as runner up award for radio advertisements, print media and variety rides. Adventure Island is an amusement park located in Rohini, Delhi. One of the most renowned amusement parks in Delhi, the park is well known among the youth since the location has been used to shoot famous songs from Bollywood -Jigar Da Tukda-Ladies Vs Ricky Behl. • 1,433 people talking about Adventure Island.